Spot silver prices ended the week in much the same way as did the spot gold price market, with Friday’s wide spread down candle taking some of the gloss off the week, and ending the silver trading session marginally below the $17 per ounce level once again. From a technical perspective this came as no great surprise as it followed the bearish shooting star candle of Thursday which was duly confirmed the following day. However, this downwards move may well be attributed to silver traders closing positions ahead of the weekend, combined with a degree of profit taking following the strong performance for spot silver in the last few days. 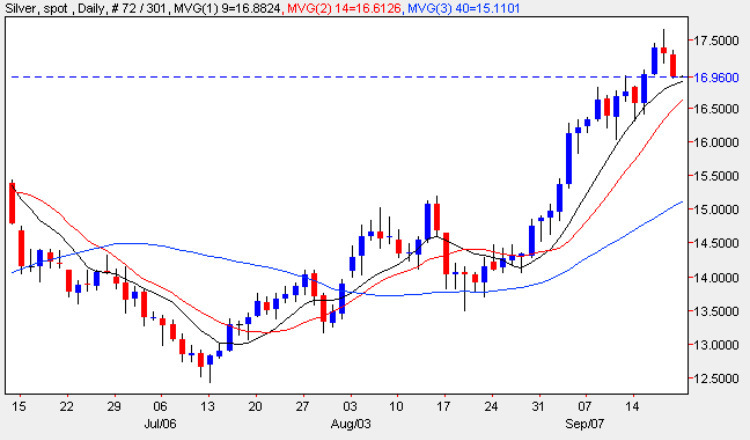 With all three moving averages pointing firmly higher, and with the 9 day moving average having provided strong support in the recent move higher, there is no reason to suppose at present that this is anything more than a short term breather before spot silver prices begin to climb higher once again. Indeed with equity markets in positive mood, and with the recent recession beginning to bottom out, the prospects for future demand for silver as an industrial metal and hence the spot silver price look very positive. However, a look at the weekly chart paints a slightly different picture, with the week ending with a long legged doji, which may well be signalling a fall in spot silver prices in the short term and indeed with the strong resistance now immediately ahead this would be no great surprise, and therefore my view for this week is that we may well see a reversal in spot silver possibly to re-test support at the $16.00 per ounce level once again, and should this hold then this should provide a platform for another run higher in due course. The short term outlook for spot silver is bearish, the medium term is sideways and the longer term is bullish.